If you’re looking for a simple way to increase traffic to your website and increase lead generation, your best bet is to boost the number of blogs your business publishes per month. Blogging is the most effective way to engage with your audience, establish and retain credibility, support search optimization, and most notably, attract new clients. Great Tip, But Why Should I Use It? There’s a reason why blogging is one of the top SEO strategies for small businesses. It creates a dashboard for your business to highlight its strengths and knowledge. Blogging shouldn’t be used as a soapbox; instead, it should be used as a resource of information for your readers to tap into. 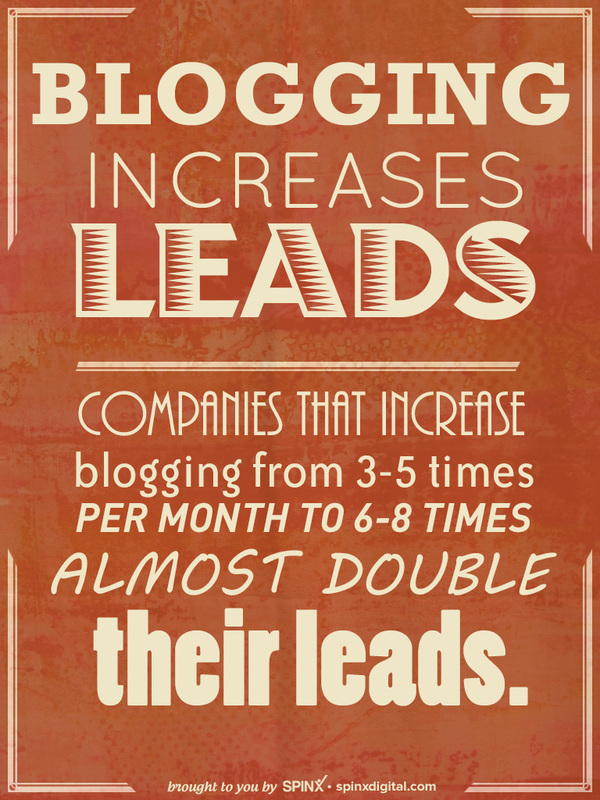 It’s no wonder that HubSpot reports companies that increase blogging from 3-5 times per month to 6-8 times per month nearly double their leads. Engage With Your Core Audience: You know about the internet, right? It’s the cool new thing; everyone’s doing it! So don’t be afraid of turning off a few of your readers. There are lots of people on the internet, so create content for the right audience. Tailor your blog to get specific information straight through to your target audience. By creating a vague, blanket blog for the masses, you’re essentially creating a blog for no one. Reel it in, stay focused, and be an authority. Don’t be afraid of alienating some people. Establish and Retain Credibility: Credibility goes hand in hand with audience engagement. 60% of all Google searches are for information regarding services and products, which results in better educated users. Create a blog that serves as a base for information that your audience can turn to. Separate yourself from the crowd and think like a consumer. Support SEO Efforts: Search engines are suckers for fresh content published on a regular basis. Pair that with good content which can attract backlinks and social signals, and you’ve got a winning SEO strategy for your blog. That said, write for humans. It’s fine to mix a few keywords in here and there, but always write with your target audience in mind. Attract New Clients: 20% of Google searches are for local companies or information, which means that your business will only benefit from carefully curated content that is useful. A potential new client is searching through your blog for more knowledge about the goods and services your business offers. Make it easy for them with informational and easy to read content that is made for humans. Just by doubling the amount of blog posts you publish to 6-8 times per month, you create an opportunity to showcase your expertise and to attract potential new clients. Each new blog member is a potential new client so stay on track, stay focused, and good luck! Do you have any tips of your own? Holler at us – we’d love to know what you think! Nice educational blog, I really like the tips provided by the blogger regarding this online marketing. Thanks for sharing.